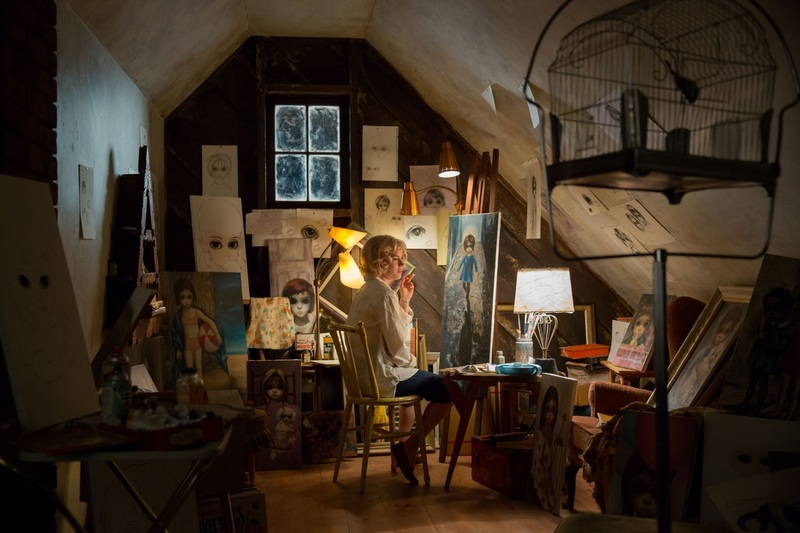 This article is a review of BIG EYES. Director Tim Burton jettisons the underwhelming big budget fare (DARK SHADOWS) and the personal (FRANKENWEENIE) for something so dialled back it barely registers; an odd choice for the gothic helmer. 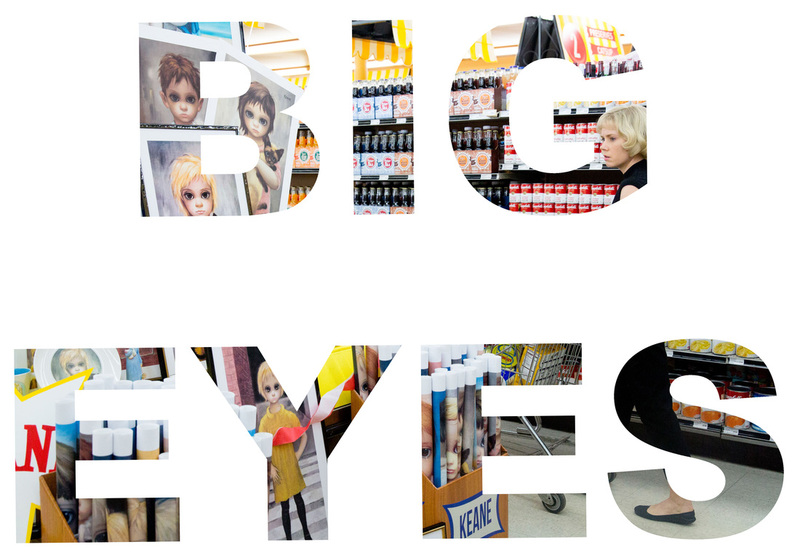 If an ED WOOD rejuvenating career sidestep was hoped for, BIG EYES is instead a movie, ahem, painted by numbers. “Based on true events,” we are told, an Andy Warhol quote, then a voice over stating the obvious from reporter Nolan, sets the tone for the simplistic spoon-fed. Northern California, 1958, Margaret (Amy Adams) does the socially rare and leaves her husband. Daughter Jane and paintings in tow, she makes a home in San Francisco. Lack of worldliness, and naiveté, are demonstrated by not knowing what an espresso is. Believe it or not, these are the writers of the engaging ED WOOD and THE PEOPLE VS LARRY FLYNT. 1950s Americana is parsimoniously presented. Era creation is absent. Contrast the corruption of innocence of the decade in THE MASTER, or the apple pie nostalgia of BACK TO THE FUTURE. Burton does seem particularly drawn to the time period (see the aforementioned WOOD and similarly monikered BIG FISH). 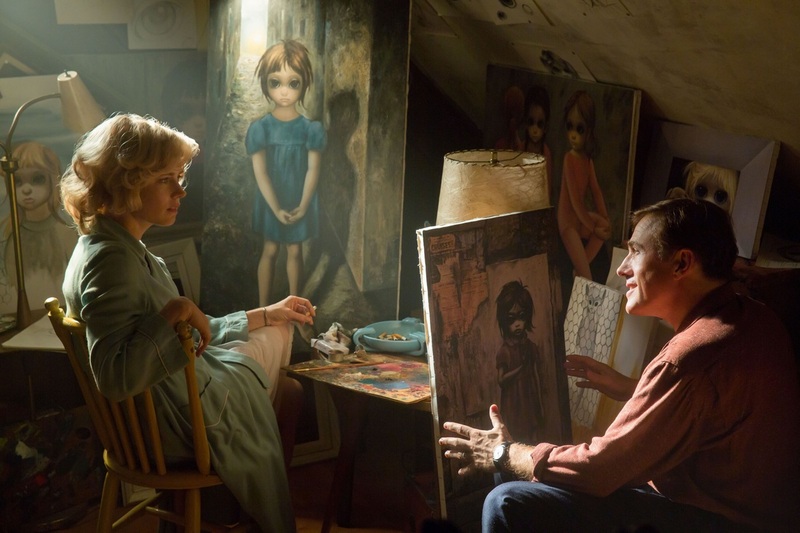 Walter Keane (Christoph Waltz) spies the mousy Margaret in a park artist avenue. Bon vivant, he begins to woo the latter. Even though she bemoans the female lot of daughter/wife/mother prison, being threatened by ex-husband for custody of Jane, makes her accept a whirlwind proposal of matrimony. Mate DeeAnn (Krysten Ritter), whose role is a one-dimensional conscience reminder, is symptomatic of simplistic characterisation. At one point Walter has an obviously dubious real estate mumbled conversation in front of future spouse; lowest common denominator pandering alert! Lacking artistic talent, Walter’s oeuvre is a collection of cliché Parisian street scenes; though his gift is as a salesman and self-promoter. Having a bright idea, using a club as an unusual method of advertising both their work, interest begins to build in his new wife’s paintings of over-sized eyed waifs. Small man syndrome and greed makes him claim Margaret’s work as his own. Creative theft has rarely been examined in the movies, and should have made for a fascinating story. 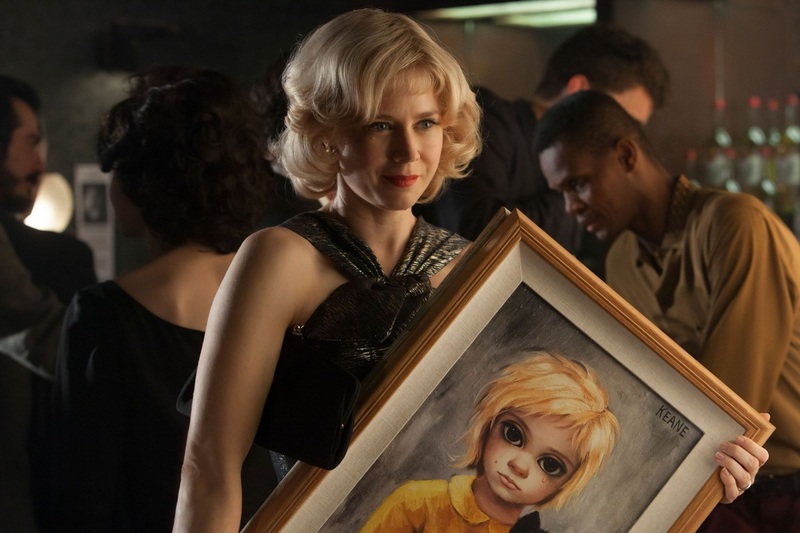 What is not examined is the specialness of Margaret Keane’s paintings. Brief mention of the sadness of subjects is all that is offered. Repetition of the same leitmotifs hammers home the sometime arbitrariness of art word success. Concomitant to that is the question: Why then such a phenomenon? Exploration of the randomness of fashion, or how a sensation is manufactured is skated. How about articulating the aesthetic muse? Eyes are the windows to the soul, Margaret glibly opines. Walking around a supermarket, where the shoppers are transformed into the large ocular embodiments of her work, is a lazy concession to travelling in a creator’s shoes. Spousal emotional abuse, where bullying forces a wife to be subservient, lacks the necessary piercing force; so much so that Margaret actually has to explain out loud how she was coerced into giving up credit. Sexual politics of MAD MEN this ain’t. Wait till you get to the court case finale. Tonal shift into ALLY MCBEAL farce territory reeks of a creative team foundering. BIG EYES is half-baked.